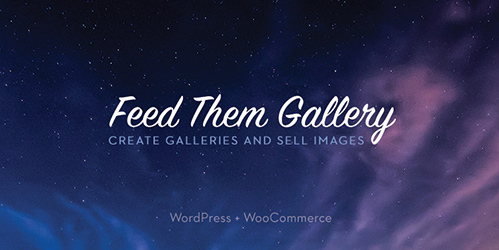 Selling photos is easy with Feed Them Gallery! You can sell your photos individually or you can sell in bulk using our ZIP’ing system to ZIP up full galleries to sell as a product. 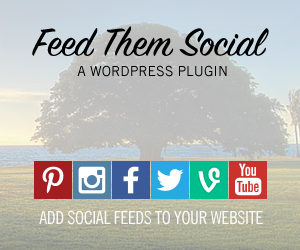 The first step is to install and activate the WooCommerce WordPress plugin. After doing that make sure you check the option under the WooCommerce > Settings > Products tab to Enable AJAX add to cart buttons on archive pages. 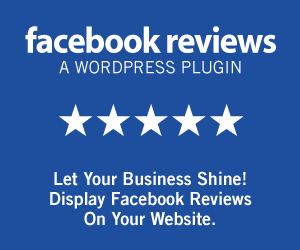 Once that is done all the WooCommerce options will become available in our plugin if you purchased, activated and installed the Feed Them Gallery Premium extension. You will find these options under the WooCommerce tab under a gallery page in our plugin. The first option and most important is the “Show Purchase Link”. Select “Yes” for this option so the cart icon and purchase text will appear under your photos and in the popup. You can also choose to change the wording for the text next to the icon. Check this option to “Auto Create a product for each image uploaded”. You must have a “Global Model Product” or “Smart Image Orientations Model Product(s)” selected for this option to work. This will create a product for EACH image as they are uploading and will use one of the Model products you will learn to create in the next section. A Model Product can best be described as something you create so you don’t have to keep recreating the same thing manually for each image you upload. We have 3 options for creating products from your images. Before we get started defining each of the 3 options we need to point out a few things first. When creating these Model Products you MUST select which model product type it will be used for in the right sidebar of the product edit page. This makes it so you don’t have to look through every WooCommerce product made in your store or if you have a different model product for every gallery. 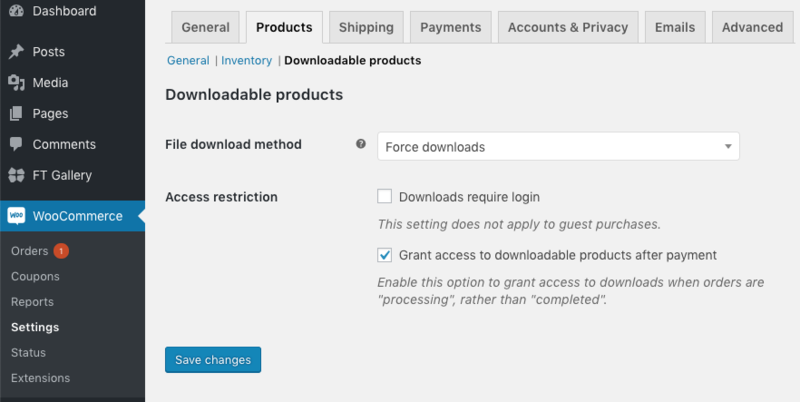 If you want customers to have access to a downloadable link after purchase you MUST go to the WooCommerce Settings > Products > Downloadable Products and choose the options you see in the photo below. This is so the user can see there downloads in the My Account page of your shopping cart also. You also MUST have Virtual and Downloadable checkboxes checked on the each Model Product you create including products that have Variations. If the product has variations EACH variation must also have these options checked. See examples images below. Here is a simple product with the Virtual and Downloadable checkboxes checked. The most import thing to remember also is filling out the price. Don’t worry about adding a file download url as that will populate automatically after adding an image to the gallery. Here is an example of a Product with different Variations. Make sure to check the Virtual and Downloadable checkboxes and don’t forget to fill out the price. Again don’t worry about adding a file url for the download and don’t worry about adding thumbnails for each variation as that will be filled out automatically too with the gallery image you upload. So on to the 3 options and what they do. The first option is what we call a “Global Model Product“. When creating this model product type you will want to add any and all variations and options you want for your images. You don’t have to add any images to the”Model Product”. 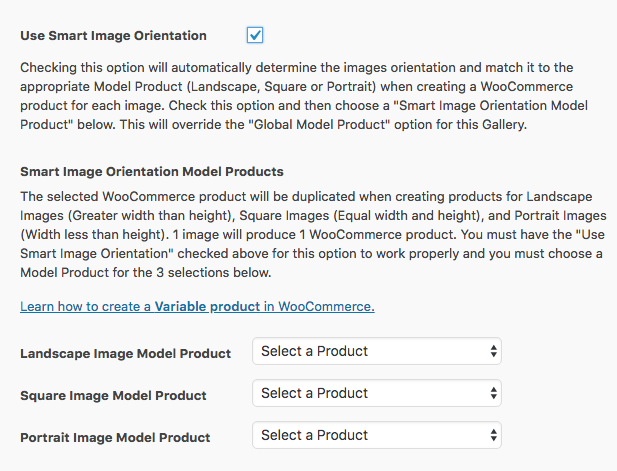 You may want to title the product something relative to the Gallery such as “Example Gallery Model Product” or if you are going to use it for all of your galleries maybe “Global Model Product”. This Model Product you choose will be used to create a product for each individual image in your gallery. When each product is created it will then get the attachment image url for that full size/resolution of the image you are uploading so after the customer purchases the image they will have access to the highest resolution you want to give them. Learn how to create a Variable product in Woocommerce. Our second option “Smart Image Orientation Model Product” is one we worked hard to bring you to save tons of time. This is especially for photographers or artists looking to sell images in different orientations such as Portrait, Square, and landscape. By creating Model Products for these three orientations our system is able to determine which orientation a photo is and use the appropriate model product. 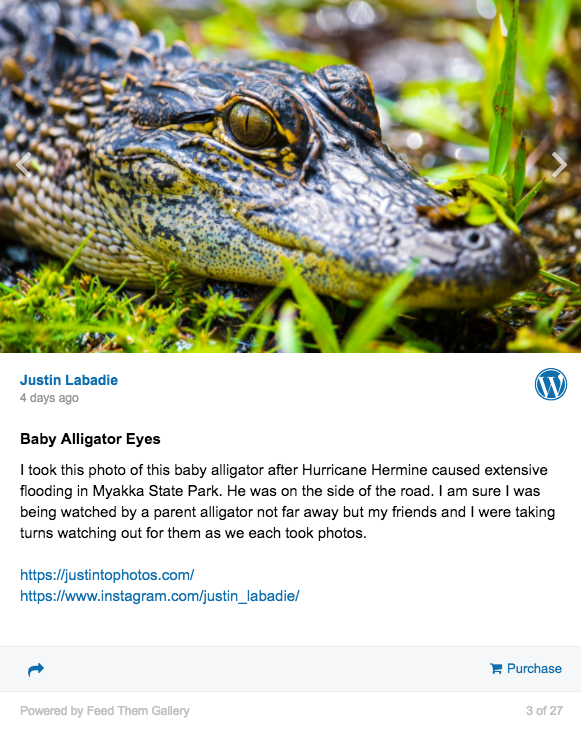 For example, maybe you are only offering 16″ x 20″ and 24″ x 36″ prints for portraits images you upload and then only offering 11″ x 14″ or 20″ x 30″ prints for Landscapes images. As the uploaded process begins each photos image orientation is determined and then the appropriate orientation is used to create the WooCommerce Product! Smart eh!? Our third option is if you want to create a product for a ZIP that contains all the images in your gallery. This product must be a simple product and must have Virtual and Downloadable checkboxes checked! Learn how to create a Simple product in Woocommerce. 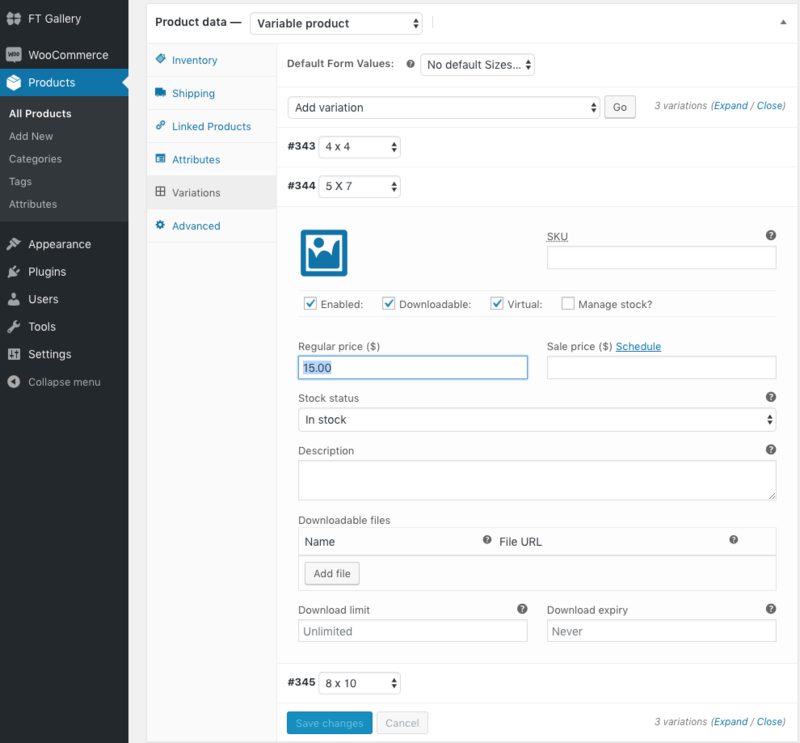 You will also find some global WooCommerce options on the settings page under the FT Gallery Tab that allows you to Attach Product to a Category named after Gallery and set the add to cart link option. Now that you have set up your Model Product(s) and options you will create your first product or products. Once you click the button the page will create your product(s) and give you a success message when it is complete. On the WooCommerce tab make sure and have the checkbox checked for Auto Create a product for each image uploaded. You must have a “Global Model Product” or “Smart Image Orientation Model Product” selected below for this option to work. Now when you upload an image to this gallery it will automatically be converted into a product. We have tested this using over 2,000 images at one time so it is solid state. How fast the image are converted to products will depend on how fast your hosting is. Create a ZIP of the Gallery and turn it into a product. If you want to create a product that contains all the images in your gallery, go to the Images tab and click on the blue button that says “Create Digital Gallery Product”. 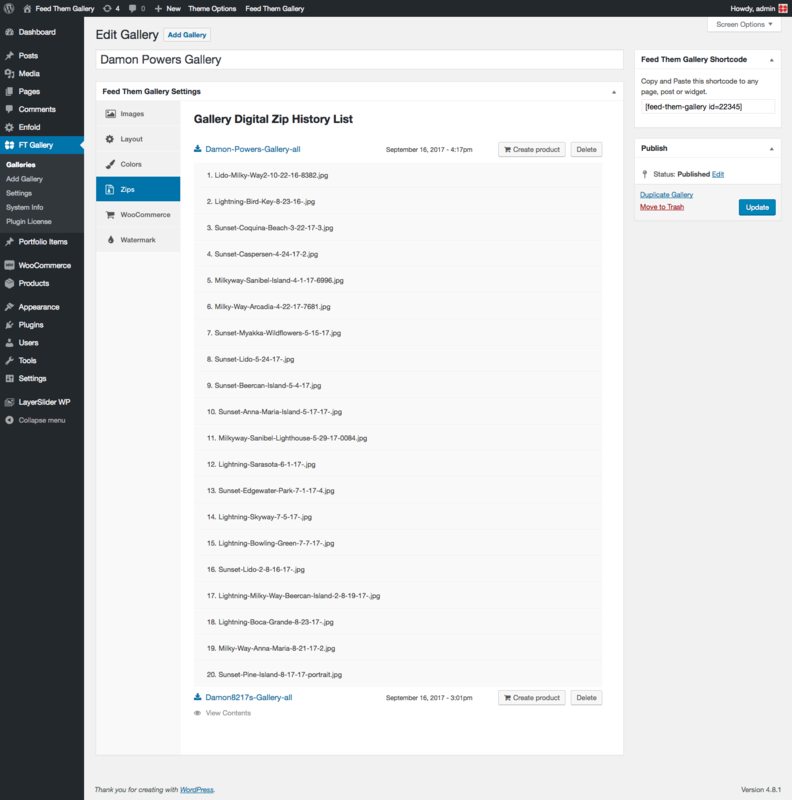 When clicking the “Create Digital Gallery Product” button you will see a loading sign and upon completion it will give you a link to the zips page where you can then see your zip of images, download your gallery zip or view the contents of the zip or edit the product that gallery zip belongs to. This button allows you to create a zip of all of the images in your Gallery and download them. 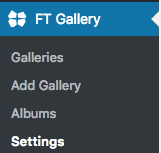 After clicking the button all of the gallery’s images will be compressed and zipped up and will automatically download them to the location you have selected for Download on your computer. NOTE: This also saves a backup of the zip for you on the ZIP tab allowing you to see its contents, download it again in the future, manually create a Woo Product from it, or delete it. Check out our Demos to view how having variations and images for sale will look like with our plugin.